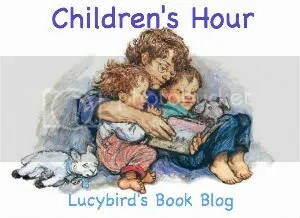 Children’s Hour is a feature here at Lucybird’s Book Blog every Thursday where I’m looking at children’s picture books. As I work in a nursery I get plenty of opportunities to look at picture books, and to see what the kids think of them so it really makes sense to use those experiences. I’d love to hear everybody’s experiences of the books I review too, and feel free to post me a link to your own reviews, I’d love to make this a bit interactive. The image (if you were wondering) is taken from Shirley’s Hughes’ Alfie and Annie-Rose books which I loved as a child. I’ve read Dinosaur Kisses to both toddlers and pre-school, but it went down better with the younger ones. The story is about a dinosaur who sees a kiss and wants to copy, but keeps getting it wrong. It’s very simple, probably too simple for a pre-schoolers, at least I think that’s why they appreciated it less. The toddlers though liked all the noises included in the narrative, and found it funny when the dinosaur got it wrong. Personally I liked the pictures which were very cute. and I had imagined it as being more a book for the toddlers than the pre-schoolers.